Towersey Morris is a mens cotswold morris side, based in the village of Towersey near Thame in Oxfordshire, England. The Winter 2018-2019 schedule has been drafted for this year, including our Mummers' Play! We will be dancing throughout October and November and the Mummers will be performing at various locations across the holiday period from Wednesday the 5th December onwards. Be sure to check back and see our updated dates. To view the full list of upcoming dates and events - please check the programme. The Summer 2018 schedule has been finalised, so be sure to head along to the Programme to see where we will be dancing. 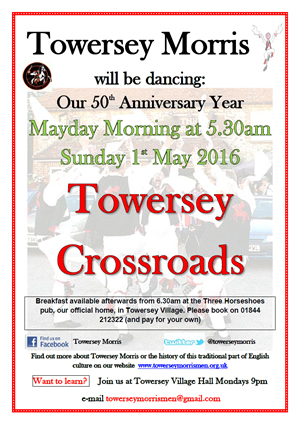 Towersey Morris will be dancing at sunrise on Mayday Morning. 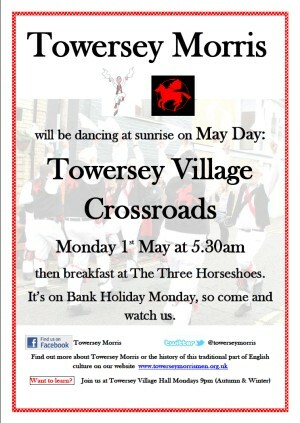 Come and join us, 5.30am on Monday 1st of May at the Towersey Crossroads. The Winter 2017-2018 schedule announced for this year's Mummers' Play! We will be performing at over 20 locations across the holiday period from Wednesday the 6th December through to Monday the 1st of January. Please check below to see where we will be, but for full postal addresses and postcodes download the programme to read offline. You can download the programme using this link. The Summer 2017 schedule has been finalised, so be sure to head along to the Programme to see where we will be dancing. 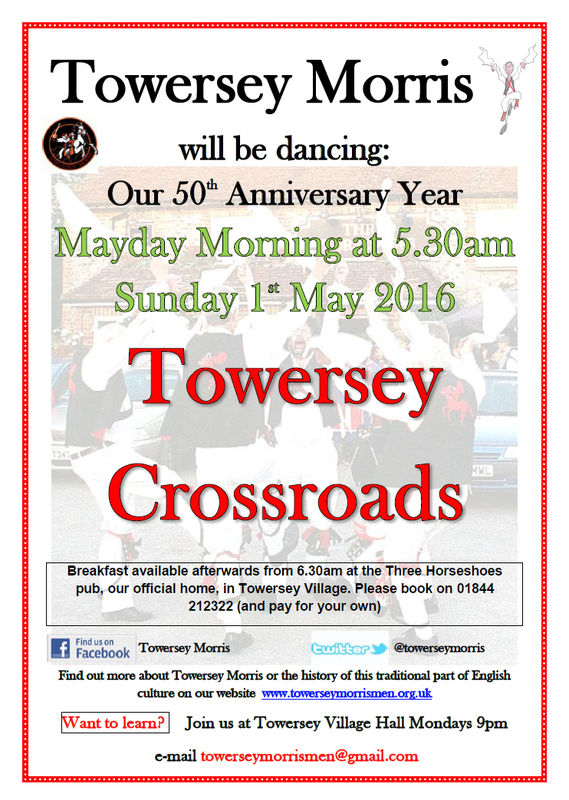 Towersey will be celebrating their 50th Anniversary with a Day of Dance on the 20th of May. We hope you can join us for some, or all of the celebrations throughout the day. The Winter 2016-2017 schedule announced for this year's Mummers' Play! We will be performing at over 20 locations across the holiday period from Wednesday the 7th December through to Sunday the 1st of January. There are plenty of oppotunities to come and see us, so be sure to come along! For a full list of upcoming dates and events - please check the programme. It is with sincere regret that we have to postpone our 50th celebrations due to the tragic, sudden and unexpected death of one of our members, Ken Foot. This will not take place on Saturday 17th September as planned. We apologise for the inconvenience this may cause, but appreciate your understanding at this very sad time. The Summer 2016 schedule has been finalised, so be sure to head along to the Programme to see where we will be dancing. 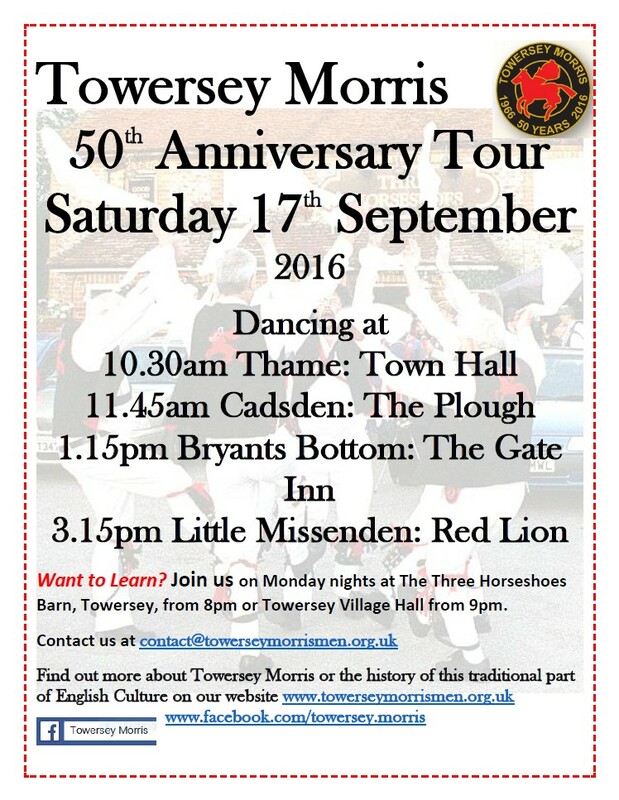 This year, Towersey will be celebrating our 50th Anniversary Year! 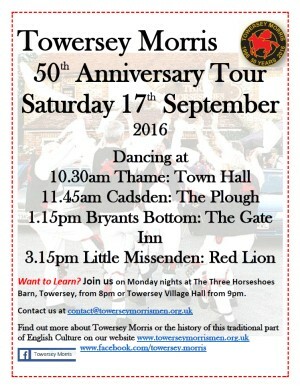 Towersey will kick off this year of celebration by dancing the sun up. Come and join us, 5.30am on Friday 1st of May at the Towersey Crossroads. The Winter 2015-2016 schedule announced for this year's Mummers' Play! We will be performing at 24 locations across 7 Days from Friday the 11th December through to Saturday the 26th. 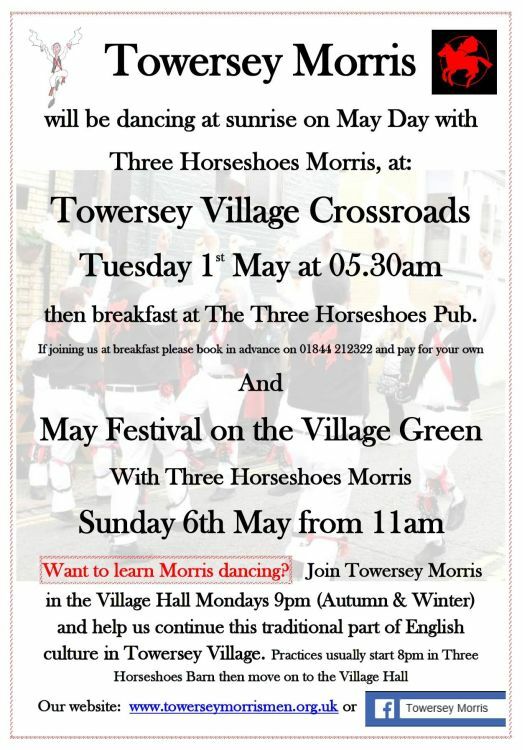 Towersey Morris will be dancing at the St George's Day Fun Day Parade! 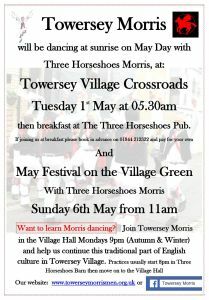 Towersey Morris will be dancing Mayday Morning. Come and join us, 5:30am on Friday 1st of May at the Towersey Crossroads. The Winter 2014-2015 schedule announced for this year's Mummers' Play! Covering 25 locations across 8 Days there are plenty of oppotunities to come and see us. We are pleased to announce that we have the Haddenham Hoofers joining us as guests on the 4th and 19th of June at Haddenham and Thame. Please check out our programme for a full list of the events over the next coming months. Hazlemere, Events kick off at Midday. Towersey Morris are going to be attending an open evening and presentations at Towersey Village Hall, Monday 11th November 2013. Cheques are to be presented to The Society for Mucopolysaccharide Diseases and The Multiple Sclerosis Trust. Come along and see what we do, see our scrapbook of events and have a go at dancing! Or, come along to watch and support us. Everyone is welcome and there is no admission charge. Towersey Morris are going to be attending an Ale, hosted by Owlswick Morris on the 16th November. 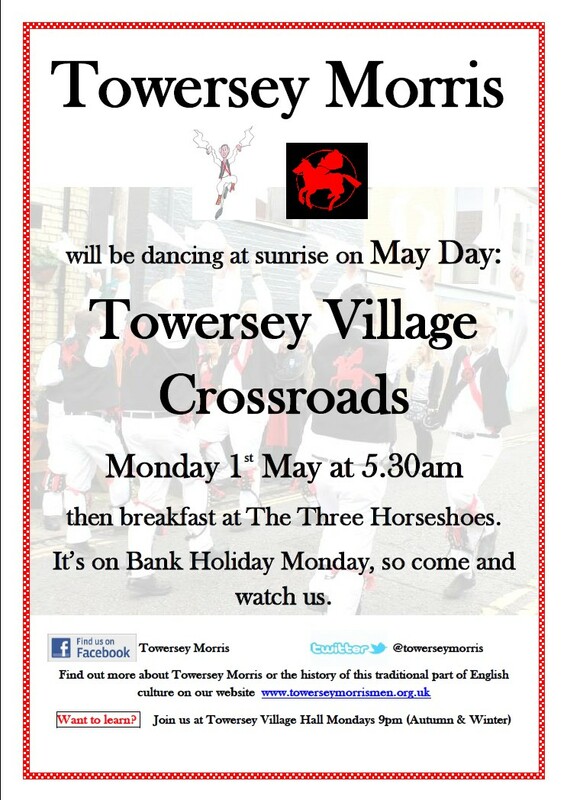 Mayday morning Wednesday 1st may 2013 5.30am at Towersey Crossroads, then breakfast at our Official Home, the The Three Horseshoes in Towersey. You can book and pay for breakfast on 01844 212 322 and you can download the poster here. Towersey Morris supported The Demon Barbers' 15th February 2013 gig at The Stables, Milton Keynes. See the Winter Programme for details. This year the Towersey Morris Mummers tours collected over £1100 for their nominated charities. On December 16th we are invited to dance at the English Folk dance & Song Society's "A Ceremony of Customs & carols"
Once again TM achieved 3 workshops and a mass dance with several sides of our students at the Three Horseshoes Pub on August bank holiday Monday. One Saturday, September 2011 Towersey Morris held a sponsored Day of Dance in the Market Square, Aylesbury, at Wendover and outside Wycombe Wanderers FC before their home match against Brentford. Over twenty different Cotswold Morris dances were performed during the day. Each dancer was sponsored so much per dance. We raised £2800-00 for the Cancer & Haematology Unit at Stoke Mandeville Hospital (formerly called The Wooden Spoon Unit). 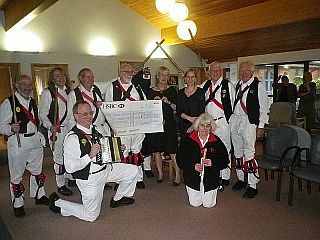 The cheque was presented on Friday, 9th March 2012 by the Squire of Towersey Morris, Andy Hardy to Dr Ann Watson, who runs the unit. We then danced for patients, their families and the staff at the unit. We included a dance called The Rose, this involved dancing round Dr Watson, weaving intricate patterns and then finally lifting her up onto our shoulders! We chose the C & H Unit as the wife of one of our members (Jenny & Peter Adshead, of Towersey Drive, Thame) had been referred to the unit with cancer. They were so amazed at the care and attention that was paid to them that they wanted to show their gratitude in a tangible way and Towersey Morris were delighted at being able to help. If you fancy joining the fun, just contact our squire Michael on 01296 435063 or by email Here and arrange to come and meet us. You don't have to stay - but most people do. Towersey Women's Cotswold Morris started last year after a workshop at Towersey Festival. For details of what's going on and how to join, phone Paul on 01844 344255.